In his first complete race of the season, Jamaican sprinter Yohan Blake showed he has returned to form with 9.93secs (0.4 wind) clocking to take the men’s 100m at the Jamaica International Invitational meet in Kingston last night (20th). The 2012 double Olympic silver medalist has had two major injuries since his 2012 performance and was a shadow of himself at the Rio Olympics in 2016 as he eagerly tried to work himself back into shape. He was fourth in the 100m final. Last night, Blake’s performance showed that he’s finally back in business. He got a decent start and executed well to take a clear lead some 15 meters out, holding his form and easing up just before the finish line. He looked easy and relaxed as he bounced away from his closest rival Ronnie Baker of the USA (9.98). Veteran Mike Rodgers of the USA completed the top three places in 10.02. His time is the third fastest in the world to date this year, with Sydney Siame of Zambia (9.88) and Akani Simbine of South Africa (9.92) ahead of him. Blake has been itching to test himself in recent weeks but has had three frustrating cases of misfortune. At the UTech Classics in Kingston, his first 100m attempt, his block slipped and he finished last. His second attempt was at the World Relays in the Bahamas when the baton did not reach him on the anchor leg in the 4x100m race. One week ago at a Clermont, Florida meet, his race was cancelled 20 minutes before start time due to weather conditions. 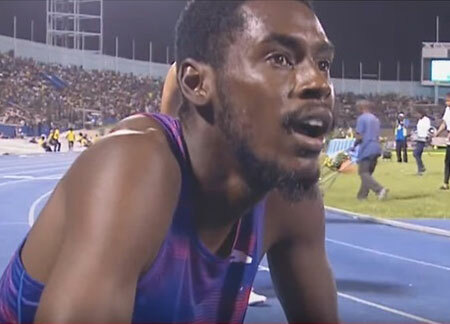 His next race will be in Boston in early June, after which he will return to Jamaica for the Racers Grand Prix on June 10, when his train partner Usain Bolt will run his final race on his home track. While Blake’s race execution set hometown fans abuzz with excitement, perhaps the top performance of the night was that of Kyron McMaster (in photo) of the British Virgin Islands who ran like a seasoned Olympian to register a personal-best and world-leading 47.80 to win the 400m hurdles. The high-quality line-up included two-time world champion Bershawn Jackson of the USA, 3rd in 48.52; two-time world championships 400m hurdles silver medalist Javier Culson of Puerto Rico, 4th in 48.76; and 2012 Olympic silver medalist Michael Tinsley of the USA, 8th in 51.16. Jamaica’s Jaheel Hyde finished second in 48.52. McMaster’s season’s best going into the meet was 48.69, which he ran in Florida. Ironically, McMaster, 20, finished third at the IAAF Under-20 Championships (formerly IAAF World Junior Championships) in Bydgoszcz, Poland, in the intermediate hurdles in 49.56, behind winner Hyde, who won consecutive titles in 49.03. Yesterday, the long-striding, free-flowing McMaster ran at a well controlled pace to take the lead from Culson at 150 meters out. The third outstanding performer was Elaine Thompson, who has not been letting up, even though she has not been pushed by anyone this year. From her season opener victory over 60m at the Queens Grace Invitational in Kingston and the Birmingham Indoor Grand Prix in England to the World Relays in the Bahamas and the really Relays in the US, Thompson keeps leaving the field a long way. 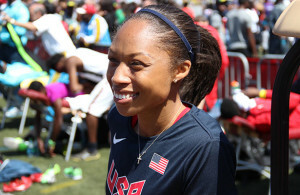 Noteworthy is that the sprint double Olympic Champion seems she has not yet pressed the gas pedal. And just when it seemed as if many were about to remove quarter-miler specialist Novlene Williams-Mills from the track, she produced a controlled and tactical race to come from behind and win the 400m in 50.54 against a competitive field. On the field, Jamaican discus thrower Fedrick Dacres was the first to erase a first meet record. He won the men’s discus throw with 66.36 meters, a world-leading mark, to improve the previous distance of 65.15 in 2015 by Vikas Cowda. The 23-year-old Dacres made the winning throw on his fourth and final attempt to surpass USA’s Andrew Evans’ 64.48 meters. In the pole vault competition, USA’s Dam Kendricks had the crowd behind his every step and vault in his bid to clear a personal best height of 5.80 meters, three centimeters ahead of second place Logan Cunningham, his compatriot, with 5.50.